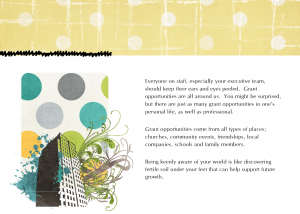 I get asked often about the methods I use to find grant opportunities for my clients. The truth is, grant opportunities are everywhere. Sure, I have purchased several grant list serve plans and I get updates every day on new and existing grant opportunities that show up neatly in my email in-box. But honestly, some of the best funding opportunities come from personal connections in one’s community. 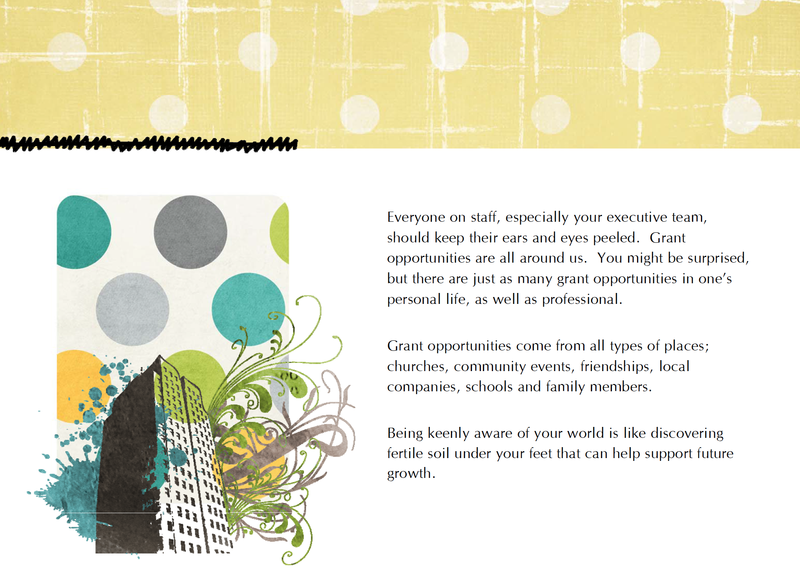 Here is a page from my new eBook about where to find grant opportunities. My new book is set to launch this coming week! Be on the lookout, it has been a year in the making! And be on the lookout for new grant opportunities too, an opportunity in the making just might be housed in the person in front of you at the grocery store check-out line, or sitting next to you at your community theater! I want to hear about your most obscure grant opportunity and how it turned out for you…comment to this blog! The best story will win a flash drive with my new eBook on it!